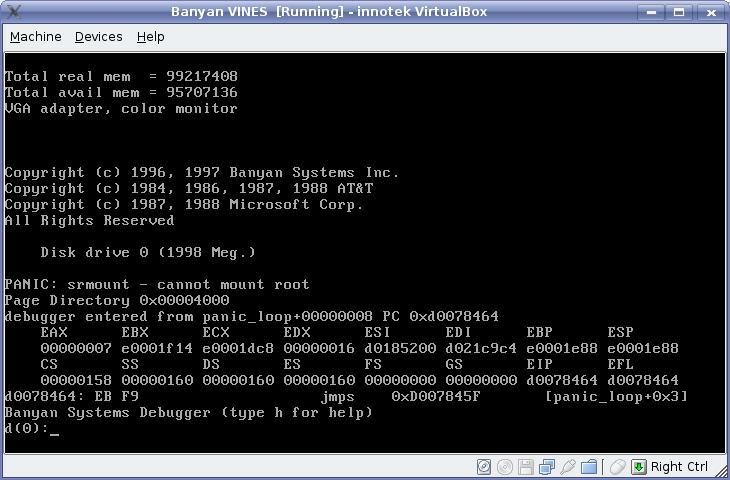 Hi, has anyone attempted to install Banyan VINES 8.5 (a System V UNIX-based networking OS) on VMware, Bochs or QEMU? I have managed to get it to install on both QEMU and VMware. However, after initial installation, it coredumps and drops into a debugging session. The install media will not boot on Bochs properly due to unsupported BIOS calls. Can you paste the core dump (screen shot)? Believe it or not, I can make sense of these things. The whole panic comes from the "cannot mount root" message. This OS either doesn't support a the virtual disk controllers/drives, or there is something wrong with your image. Thanks. I doubt there is anything I can do now, seeing as Banyan went under a long time ago, and there don't seem to be any drivers available for the virtualisation software's emulated drive controllers available anywhere (unless I'm not looking in the right place, which I doubt now). With most UNIX's there is generally a way to force the use of the BIOS to access disks. I've had a look at the link, but it turns out to be a BIOS/firmware upgrade for older Compaq/HP machines. Not sure how much the Banyan System V deviates from the "original" one, but I'll have a look to see if there's a way to force it into BIOS disk access mode. Interestingly, it may be doing that at install time, since it's able to write the VINES OS onto the disk image in the first place, but there's obviously something that's absent/broken that the OS supposedly doesn't need after installation time (just a guess). I finally got it working (almost), except for a slight problem towards the end, which I have been unable to solve. I have written a how-to on installing it, based on what I've managed to figure out. It turns out to be an LBA and BIOS disk cylinder size issue. I will be making the how-to available to anyone who wants it. I recently got Banyan VINES 8.5 to install and run in VirtualBox. I posted details to the VirtualBox forums. The only thing is I don't have any of the codes needed to activate features. But VINES is up and running, I can get to admin panels, and poke around at things.